Dr. Saeeda Shahid completed her MBBS in 2007 from Xinjiang Medical University in China followed by a yearlong internship from Federal Government Poly Clinic Hospital, Islamabad, Pakistan. She is a Licensed Registered Medical Practitioner from the Pakistan Medical & Dental Council. 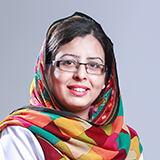 Dr. Saeeda Shahid has more than seven years’ experience in well Established Hospitals in Pakistan. She has worked dedicatedly in various disciplines in General Medicine, Paediatric, Obstetrics and Gynaecology. She is currently working as a general physician with special interest in Obstetrics and Gynaecology. She is an active member of various organizations and foundations such as Pakistan Medical and Dental Council, Life care Organization, Al Jannat free medical camp organization, Al khidmat Foundation, Islamabad, Pakistan. She has attended many seminars and training including BCLS and ACLS certified by Sind medical college association of North America. Dr. Saeeda has certification in Advanced Ultrasound Techniques from Skill Development Council, Islamabad, Pakistan. She is fluent in English, Urdu, Hindi, Punjabi and working in Pashto and Arabic.